These are my Worlds race journals. I send daily updates home to friends during the events and often receive good advice each day but I also find them to be a useful analysis tool when preparing for the next event. I’m making them public so that others might learn something from them. Terrigal is a beautiful coastal village 90 minutes north of Sydney. I’m one of 350 sailors competing in the 2008 Laser Master World Championships. I arrived early to train with Mark Bethwaite, who lives in Sydney and sails pretty much full-tine. We spent a total of 17 hours sailing on Sydney harbor and “outside the heads” in the open ocean. Was good upwind, but slow downwind compared to Mark. Conditions in Terrigal: large ocean swells with lumpy waves on top. 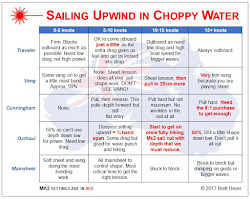 Tough going upwind with shifts on most waves, and hard to catch downwind. Downwind speed will win the world championship. Mark Bethwaite (AUS), 7-time and defending world champion. Mark is the one to beat. Very fast in all conditions, especially downwind in big waves. Jack Schlachter (AUS), former #2 in the world, this is his home club. He has the advantage of knowing how to sail in these waves. Keith Wilkins (GBR), with a record 10 world championships. Amazing sailor (duh). Wolfgang Gerz (GER), Finn Gold Cup winner. Have never sailed against him, but obviously really fast. Robert Lowndes (AUS), former #2 in the world. Always fast. Tim Alexander (AUS), former crew for Mark in FDs in the Olympics. Michael Nissen (GER), #2 last year. Came close to beating Mark. Peter Griffiths (NZL), the Kiwis are always quick in a breeze, Peter is probably the fastest.William Symes (USA), former #2, trained with him this week. So to make the top 5, you need to beat several world-class sailors. Tough crowd. I’m taking a different approach this year because I felt too much paralysis by analysis last year. I’ll be taking simpler, higher level notes. Racing starts later today, should be fun. We waited until 3:00 for the rain to stop and winds to settle down. The boat end was heavily favored. Could not break out and got rolled at the start. Rob Lowndes was leading. The wind died and shifted. Was in about 10th when the race was abandoned. We’ll try again tomorrow. The plan is a good conservative start, use upwind speed to stay in the front row, and try to hang on (and learn ASAP) downwind. The 2 Germans have apparently been here for weeks practicing in these unusual waves and it shows. Race 1: started mid-line below Mark and got rolled. After a minute in the cheap seats, took about 25 sterns to get off to the right. Good speed upwind, rounded 8th. Not-so-good speed downwind in the swells (found it really hard to catch and surf). Caught a few on the final beat, finished 1 second behind Mark to get a 6th. Race 2: Mark won the pin and really punched out to win the race. I got a good conservative mid-line start in clear air. Rounded 4th behind the two Germans. Lost 2 on the run, held even on the second beat. On the top reach, went low and was rolled by a group of 6 in a gust – ouch. Lost another 2 on the run, finished 1 second ahead of Keith Wilkins (GBR) to finish 14th. Definitely discard material. Upwind through the waves is working well, downwind is s-l-o-w compared to many others. Lots more sailing to go. Terrigal was chosen because of its strong steady winds. An unusual weather pattern has forced the organizers to have us race in marginal conditions (a light forecast for Friday and very heavy conditions predicted for the final day on Saturday I’m sure is adding to the pressure). We waited for the breeze and started at 3:00 in light, lumpy conditions – something that I like sailing in. After about 2 minutes, those who started on the right were 100 yards ahead, with Mark Bethwaite in that group. Such a huge difference is unusual so soon after the start. What followed was either pure joy or frustration, depending on what route you took. The race was won by a person whose previous best was a 42. Defending world champion Mark Bethwaite slipped from the lead pack to DF last. I finished 37. Wednesday is a rest day, so we’ll be back on the water Thursday for 3 more days of competition. Two races today. Mark Bethwaite won both of them with pure boat speed, particularly downwind. He’s being chased by the 2 Germans and 2 more Aussies who are very good and make no mistakes. My races were identical (good starts, top 5 at the fist mark, and not very fast downwind). Would have got a 7th in both, but cut off 10-time world champ Keith Wilkins at the first mark of the second race and had to do my 720. That single mistake cost me about 10 places. Tough crowd. 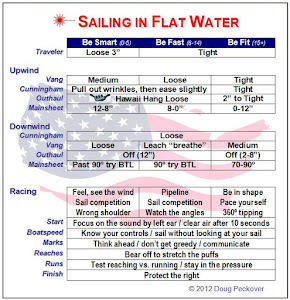 John Bentley was the first US sailor to figure out how to work the wave patterns (he was really quick downwind today). He explains it like this: 2 wave patterns, when on a wave, look to a wave in another pattern next. I’ll try it tomorrow. There’s always room for improvement when competing with people at this level. With the increased wind, the waves were again different. The boat slows down going up the wave as the apparent wind shifts to give you a lift, and then back again as the boat accelerates down the wave. The result was a 15-20 degree shift, but the rhythm was made difficult because a smaller wave at the top could give you a harder lift or immediate header. Timing is everything and there were many people doing it better than me. Just working the waves really hard did not seem fast as it does with other wave conditions. In this the second-to-last day, there were no pre-start maneuvers. Instead, we saw a real battle for the lead between the Mark Bethwaite and Wolfgang Gertz, with each winning a race. In the first, Wolfgang started just below me and I was able to watch him motor away – just beautiful. Not hiking the hardest, but really smooth in theses difficult conditions. The speed difference between the lead pack and the rest of the fleet is significant. We headed out on our final day in a beautiful southerly breeze. People were really aggressive on the starting line and I was black-flagged along with a dozen others. So having to count my 37 from day 3 put me out of contention for the top ten. I sat that race out watching Wolfgang Gerz (GER) and Mark Bethwaite (AUS) match race, with Wolfgang pushing Mark from 2nd down to 6th. This put the German just ahead going into the final race. With a good start and having a better feeling for the conditions, I rounded the first mark of the final race in the lead. There was some confusion about the position of the lower gate because the waves were so big that we could not see marks. Mark and I went right and another group led by Michael Nissen (GER) went left. Michael was correct, turning the lead positions inside out. After the next work and reach, Wolfgang led Mark by 20 seconds. I stayed out of the way of people still in contention and spent more time watching than racing as Mark caught Wolfgang on the run and reach. 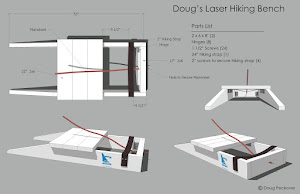 Mark was able to put 2 boats between him and Wolfgang on the final work to secure his 6th Laser Master World Championship. Great stuff. The next worlds are in Canada in 18 months. The fleet is definitely faster and will probably improve again. I’ll be focusing on practicing in large waves, which is the area that needs the most improvement. Competing in these world championships is an unbelievable blast and a great excuse to stay in shape.